It's been a while since I've posted a review, but please don't take this as any indication that Black Feathers was anything less than enjoyable. What actually happened was that it simply took me a long time to get around to writing the review, and then when I did, the failure of Blogger, Chrome and Windows 8 to get along and play nicely meant that I lost three-quarters of it when I posted it. In doing so, I also lost the will to live, and have been sulking ever since. Anyway - this is my second attempt. Joseph D'Lacey is best known as a horror writer but Black Feathers, published by sci-fi and fantasy specialists Angry Robot, isn't really horror as such. It's a dark, dystopian modern fantasy tinged with folklore and elements of a coming-of-age novel, with a touch of eco-thriller added to the mix, although it's certainly creepy, not to mention gory, at times. If you think this makes it sound like an uneasy mish-mash, don't worry: the various threads are woven together neatly into a cohesive tapestry. The story has two narratives. The first is the story of Gordon Black, born in the early 21st century into a Britain that teeters on the edge of environmental disaster, civil unrest and the rise of totalitarianism. The second is that of Megan Maurice, a girl living in a Britain that exists decades - perhaps centuries? - later, in which apparently isolated communities survive in a regressed future. Throughout both narratives stalks the mysterious figure of the Crowman, an ambiguous folkloric figure who for some signifies the end of days and for others has a more positive significance. 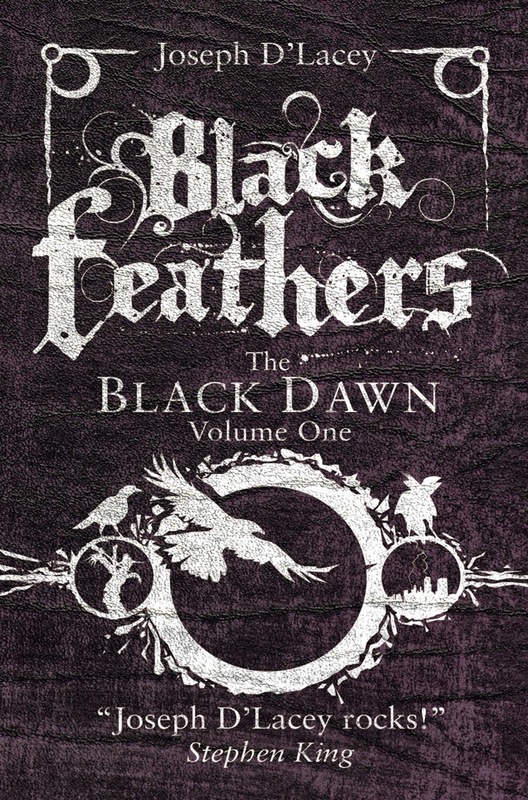 Various omens signify the importance of the Crowman in Gordon's life from the moment he is born; for Megan, who one day sees 'Black Jack' and finds her life turned upside-down as a result, the Crowman is a powerful figure to whom she and her shaman-like mentor Mr Keeper must devote themselves. Gordon and Megan are clearly connected to one another, via the Crowman, but how? Joseph D'Lacey's imaginative vision is impressive, as is the quality of his prose. D'Lacey knows when to be stark and when to be lyrical and evocative, and the characters of Gordon and Megan struck me as surprisingly believable, given the circumstances in which we find them. The settings, too, are all too believable, chillingly so in the case of Gordon's alternative early 2000s. 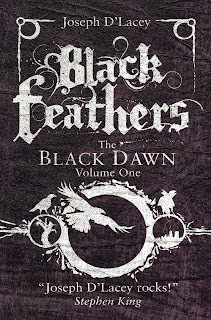 Black Feathers is the first of two 'Black Dawn' volumes, and it's fair to say that it does feel very much like the beginning of a story, rather than a complete one; this also means that the pace at the start of the book is perhaps not as fast as some might like. However, the tension, particularly in Gordon's chapters, built rapidly enough to keep me turning the pages and my appetite is well and truly whetted for book two. *NB If you wanted a fitting soundtrack to this book, you could do worse than the beautiful post-apocalyptic folk concept album by the incomparable Jon Boden, Songs From The Floodplain.